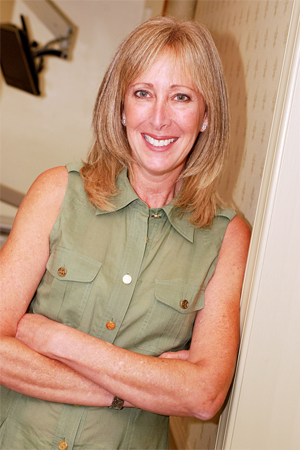 Dr. Kamen and her staff are dedicated in providing patients high quality, gentle dental care in our newly renovated state of the art office conveniently located in Armonk, NY. We are 100 yards off of Route 684 at exit 3 North Bedford. Our emphasis is on prevention and patient education to assist you in getting and keeping a healthly beautiful smile for life. Our website includes descriptions of the services we offer. Gentle dentistry is the primary goal of our office. Dr. Kamen recieved her DDS degree from Emory University. She completed a residency at Mount Sinai Medical Center in Manhattan. As part of her residency she had rotations in the Phobia Clinic and the Anesthesia Clinic. She is a Fellow of the American Academy of Implant Dentistry, and has extensive experience in cosmetics, implants and pediatric dentistry. She lives in Northern Westchester with her husband and son, and is very active in her community. Debbie has been involved in the dental field for 35 years as a dental assistant, treatment coordinator, insurance secretary and office manager. Her pleasant personality and caring ways greets you before you walk in the door. She is always ready to assist you with any questions regarding insurance, payment plans and treatment coordination to meet your busy schedule. Debbie has two children, six grandchildren and lives in Southern Westchester. Her interests include music, cooking, and reading. Chandler is the newest addition to the Advanced Dental Care of Armonk family. She received her dental assisting certificate at the Dental Staff Institute in Matthews, NC. She has 4 years experience in all phases of dentistry. Her caring manner and smile put patients at ease. She is recently married and has moved here to start her life with husband Patrick. In her spare time, Chandler enjoys reading, movies and spending time spoiling her dog Panda Man! Peggy received her Dental Hygiene degree in Rochester, New York. She loves her work and takes much pride in being a healthcare provider. Peggy has been practicing for over 35 years and has completed over 200 hours of continuing education classes. Peggy grew up in Yonkers and lives in Pleasantville. Her husband Fred is an Insurance Claim Adjuster and coaches Varsity Football & Basketball at Eastchester High School. Peggy’s daughter attends and plays basketball for Franklin & Marshall College. She is 20. Her son Trey is 10 and an avid Yankees and Pittsburgh Steelers Fan. Their family motto is (of course): A Day Without Sports is Like A Day Without Sunshine. Peggy’s hobbies/interests include gardening, country music, spending time with friends and cooking with her son.